But this was going to be a real shot in the dark, as the Pearls were designed for the cave flows in the 0-20cm/s range, and the ocean is considerably more rough & tumble than that. 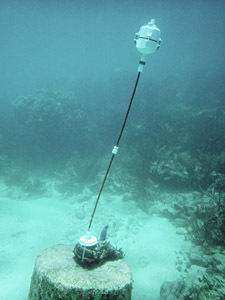 After a bit of digging through her reference database, Trish found a write up of an experiment that had been done with acoustic doppler velocity meters at Puerto Morelos; just up the coast. A quick review of that paper gave me some sense of just how tricky it would be to get meaningful data out of my twitchy little accelerometers. While I chewed on that nut, Trish spoke with CEA’s director, who was quite keen on the idea of putting our new instruments in Akumal Bay. accelerometer readings, hoping that my “average reading” would span the shorter frequency wave cycles. Each sample would consist of thirteen separate accelerometer readings, separated by the maximum watch dog timer delay of 8 seconds, and then I would throw away the extreme high and low values before calculating an arithmetic mean. I was in the process of running tests with these modifications when Trish returned to our dorm room with Gabriel Rivera (from CEA’s water quality program), who told me that the centers director had arranged for a boat and that they already had an installation site in mind which they wanted me to look at. Trish already had a full schedule of work at Rio Secreto, including a public presentation of her cave research (in Spanish), so once again I drafted Monika as our team photographer and we set out for the launch. The boat headed straight for one of the main reef buoys, and I was a bit concerned that they intended to anchor my delicate little sensors to that heavily chained beast. 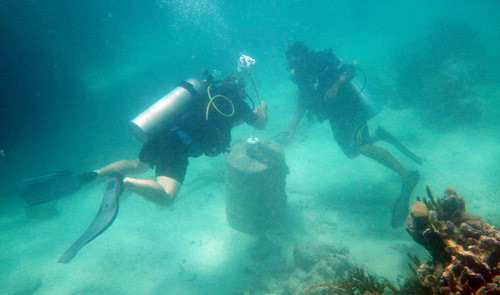 But once in the water, Marco guided me to an much older cement barrel anchor that was still in place, though it had rusted beyond use as serious anchorage. This was fantastic! 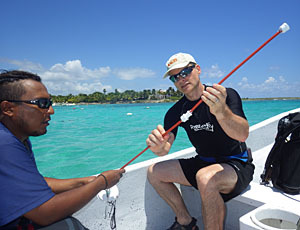 We zip-tied the pivot and support rods into place, and returned to the boat for the sensor itself. A few minutes later we had the sensor in place, but the poor thing was bouncing back and forth like a ping-pong ball. I had to do something to damp down those wild displacements, so I removed about 80 grams of the eternal ballast mass, giving the flow sensor a much stronger vertical restoration force. Secure enough from boats, waves and, hopefully, tourists. The unit was in the center of the water column (at about 3m) and despite the roil of the surf above it now seemed to be consistently leaning in the direction of the particles we could see floating by. Our first open water unit had been deployed! Our boat rental about to expire, and I now knew that I had to alter the ballast on the two remaining units, so we returned to shore for showers and a late lunch. Gabriel and I re-calibrated the last two units in a tide pool, and I gave him the last of our anchors and support rods so they could install the last two sensors after CEA staff had a chance think about other suitable locations. After that I drove up to Rio Secreto, making just in time to catch the end of Trish’s presentation. Her talk ended with a gratifying burst enthusiasm from the R.S. staff as we handed the 2 bar pressure sensor over to the science liaison who had been our guide a few days before. She promised to put it into the cave near the drip sensors as soon as she had an opportunity. This entry was posted in Developing a FLOW ≋ sensor, Expedition Reports & Updates on September 19, 2014 by edmallon.